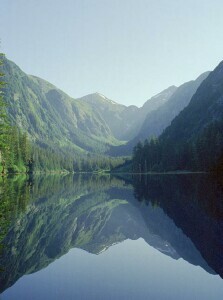 A crystal clear scenic lake nestled in a 3000 foot deep narrow valley. Canoes are usually available for paddling on the lake. The lake may freeze in the winter. The distance and time is from Bear Cove (see the Bear Cove Page). The total round trip distance from Herring Cove to Medvejie Lake is 8 miles and the time varies depending on mode of transportation. Medvejie Lake makes a good half-day or all day trip if you want to spend some time relaxing and exploring at the lake. The total elevation change along the trail is about 240 feet over about one half mile. The most difficult place to find the trail is at the very beginning. After crossing the creek it is not always obvious where the trail is, but once found, it is generally easy to follow. The very beginning of the trail may involve a stream crossing (either by wading or crossing a fallen log), depending on water levels. Parts of the trail are quite muddy in wet conditions. The trail is generally unmaintained. There are places where it is necessary to stoop or crawl to get under a fallen tree.